Economic activity that occurs under the tax radar has become a major weight on those who shoulder the burden. A look at Greece, Italy and Spain – among the very few developed countries with an even larger shadow economy than Israel’s – shows where such national behavior can lead. The severe economic problems experienced by a number of European countries emanating from the recent global recession have illuminated problems that are shared with Israel – even though Israel has thus far weathered the recession much better than most countries. Large underground economies in Greece and Italy seriously limit the ability of these countries to garner urgently needed domestic resources for dealing with their predicaments, and do not provide much of an incentive for the citizens of other European Union partner countries to grant financial support drawn from the taxes that they pay. Israel, a country that is not immune to volatility, must learn from their example the extent to which a large underground economy restricts a country’s ability to respond effectively to an emergency situation. This article is an excerpt from the chapter, “Public Spending in Israel – A Big Picture Perspective,” written by Dan Ben-David, Executive Director of the Taub Center and a Tel-Aviv University economist that appears in the recently published State of the Nation Report by the Taub Center. The extremely high rates of non-employment in Israel reflect not only problematic work habits by a large and growing segment of the population, but also what would appear to be – from an anecdotal perspective – quite extensive levels of tax evasion. The severity of non-compliance with the country’s laws is very difficult to gauge, but its pervasiveness in some sectors of the population and business sectors is also difficult to ignore. The anecdotal evidence receives empirical support from research as well. A recent World Bank study by Schneider, Buehn and Montenegro (2010) provides a glimpse into the size of Israel’s shadow economy and how it compares with other countries. They rank 151 countries according to a rough estimate of the size of their shadow economies, based on multiple indicators including currency demand and the rate of official labor force participation. The figure looks at how Israel compares to 25 OECD countries. While the apparent problems of Greece and Italy eclipse Israel’s as far as shadow economies are concerned, Israel, nonetheless, has some substantial economic activity that is hidden from the eye of the tax authorities. 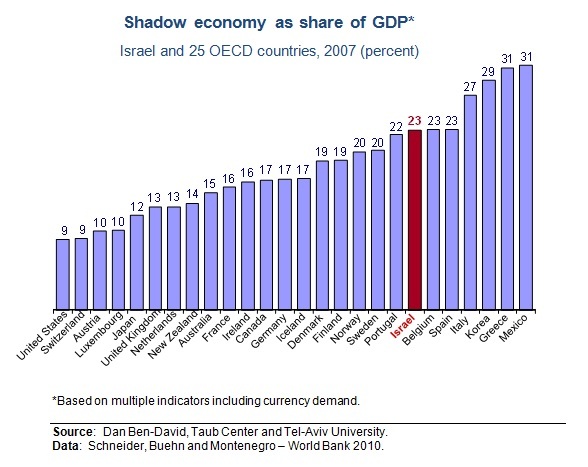 According to Schneider, Buehn and Montenegro, the size of Israel’s shadow economy reached 23 percent of its GDP in 2007. This is considerably greater than Germany (16.7 percent), the United Kingdom (13.2 percent), Japan (12.1 percent), and the United States (9.0 percent). This large a share implies an enormous amount of economic activity that is taking place outside of the formal public eye – a sum of 187 billion shekels in 2010 alone. Such an extensive shadow economy skews the shouldering of the public burden in a substantial manner, leading to high tax burdens on some portions of the population while other segments of the population who work – while formally appearing not to do so – not only do not bear their share, they actually artificially inflate the burden by receiving welfare assistance and subsidies while they appear to be much poorer than they are.